Good friend and colleague Johnny Anonymous, co-host of ATS Live, and lead investigator for the Above Top Secret organization was the first to alert me to the now “viral video” and story of the alleged “strange explosion in space” as recorded by one Elijah Prychodzko, a young Sacramento, California resident. The story broke locally on the 30th (December 2012) and I received Johnny’s e-mail the following day. The video was shot with an iPhone through the eyepiece of a telescope, so CBS13 had to enlarge it to get a better look. It was shot on Dec. 20 around 5 p.m. in Sacramento by viewer Elijah Prychodzko. ‘I saw something that I’d never seen before. I saw another object orbiting this — whatever it was up there, and I’ve never seen anything like that before,’ said Prychodzko." The video that accompanied the article was of the local newscast that aired the story (basically, reiterating the printed article) ; embedded therein was an interview with Prychodzko, along with “snippets” of his video he delivered to Cody Stark (a reporter Good Day Sacramento)). As is most often the case the “news blurb” contained only snippets of the video; however, the news segment, said snippets and its implications did “set the hook” and compelled me to dig deeper. “now check this out, I’ve never seen this before and I’m actually surprised my phone’s doin’ this, but ahh, check this out. Oh my god! It just blew up! What the hell?! Something just blew the hell up! It was orbiting and now it blew up!" Another peculiarity or yellow flag if you will, was that the explosion seemed to be “static,” although there appeared to be two objects moving (more on that later) away from the blast. Of course we are lead to believe that “the explosion occurred in space,” and supposedly where the planet was seconds ago—is the image of what appears to be an explosion with a conglomeration of bright, bits and pieces now larger then the size of the planet itself. Although there was a break in segments of the video (prior to showing the telescope), the impression given is that it was just seconds during the time that Prychodzko viewed the planet in good health, then walked over to the telescope and witnessed/recorded the explosion, or more specifically the aftermath. This notion for me gave rise to “explosive velocity”; the point being that an initial explosion of whatever source would take time to widen out to a planetary scale—it would not occur in just a few seconds. Of course that brings us around to the explosion itself, which naturally can’t take place in the vacuum of space, certainly not the way we’re accustomed to in an atmosphere. Lastly, and probably the most obvious is that anything as grandiose as an explosion on a planetary scale would have had astronomers of every flavor in an uproar and would still be dominating mainstream news. Having been a student of Ufology for over 40 years, I can’t begin to recount the many times weather balloons were thrashed out, so much so that the topic became a running joke with researchers/investigators etc. I think I actually laughed out loud as I read the a fore mentioned commentary; however, I have seen images of “bursting weather balloons” over the years as they reach the upper atmosphere and although I didn’t recognize it as such initially, the recollection returned after I read the declaration. Heeding the commenter’s advice I quickly culled a few videos from YouTube showing weather balloons climbing to the upper atmosphere and subsequently bursting and voilà! 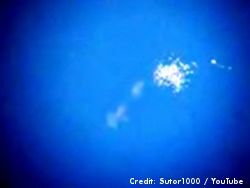 There is no question that the mystery image or so-called “explosion in space” is neither. The radiosonde is a small, expendable instrument package that is suspended below a 2 meter (6 feet) wide balloon filled with hydrogen or helium. As the radiosonde is carried aloft, sensors on the radiosonde measure profiles of pressure, temperature, and relative humidity. These sensors are linked to a battery powered, 300 milliwatt radio transmitter that sends the sensor measurements to a sensitive ground receiver on a radio frequency ranging from 1668.4 - 1700.0 MHz. By tracking the position of the radiosonde in flight, information on wind speed and direction aloft is also obtained. Observations where winds aloft are also obtained are called "rawinsonde" observations. The radiosonde flight can last in excess of two hours, and during this time the radiosonde can ascend to over 35 km (about 115,000 feet) and drift more than 200 km (about 125 miles) from the release point. During the flight, the radiosonde is exposed to temperatures as cold as -90 o C (-130 o F) and an air pressure only few thousandths of what is found on the Earth's surface. When the balloon has expanded beyond its elastic limit and bursts (about 6 m or 20 feet in diameter), a small parachute slows the descent of the radiosonde, minimizing the danger to lives and property. To Hoax or Not To Hoax? So, the evidence is clear that the video as presented by Elijah Prychodzko is not some mystery explosion in the cosmos, nor a UFO being shot down in our atmosphere; it is in this instance, no pun intended—A WEATHER BALLOON! The question now becomes, “did Prychodzko innocently misidentify this mundane object?” Granting the fact that watching one burst through a telescope and not knowing what it was/is could leave one scratching his head. One chore left to do would be to contact local offices of the National Weather Service to affirm or disprove the launching of a balloon in this vicinity on the 20th of December. Aside from that, all of the videos of weather balloons bursting in the upper atmosphere, necessitated movement of the telescope or camera as the balloon(s) continued to rise. We see no evidence of this in Prychodzko’s example; quite the opposite in fact, as he leaves the impression that the telescope was “preset to a static position” in order to film a planet as he claimed in the video. Moreover and as stated above, the image of the “balloon bursting” seems to be motionless, as if it’s a “still shot” from a video, rather then an actually video itself. 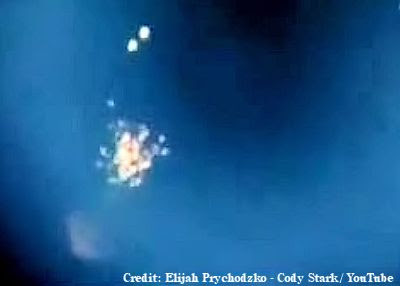 Additionally, the image appears to be “upside down” in comparison to several other videos of whether balloons bursting, as the radiosondes/parachutes packages appear to be “above” the balloon itself. Finally, there is no explanation why Prychodzko was recording the video to begin with, and in my view his demeanor and actions didn’t seem to fit the gravity of his declared scenario or sequence of events. Whether this was an “intentional hoax” perpetrated by Prychodzko or not, I’ll let you the reader decide . . ..
Just so darn disappointing...was hoping that perhaps we had developed something to protect us from danger from space aliens. Okay...laugh at me, but since seeing "The Day The Earth Stood Still" at the theater as a child with my parents, I have always wished for some sort of assurance of this kind....and yes, I am a Christian and believe in angels, as well. This is why I really like your website. You present the videos and pictures with no wild claims as to what it is. Anf then actually post a follow up to the story when the UFO becomes an IFO (identified flying object). Also, as someone who is also an avid amateur astronomer with a 10 inch Meade telescope, I tend to believe that the person who shot this video is intentionally misleading people. There is no way that you could mistake a weather balloon in your telescope for a planet, let alone track it. The Meade telescope will track and keep any astronomical object (planets, stars. etc.) in the eyepiece for hours. There is no way his Meade telescope would track a weather balloon without him noticing that it wasn't moving in the same manner as everything else in the sky. Thanks for the kind words and taking time to make comment; However, we (here at TUFOC) often are a "reflection" of mainstream-media, and cover "everything" UFO; hence wild claims come down the pike. As to your assessment to Prychodzko–I whole heartily agree! If he was using an astronomical telescope Then Wikipedia says it all. Most telescope designs produce an inverted image at the focal plane; these are referred to as inverting telescopes. In fact, the image is both inverted and reverted, or rotated 180 degrees from the object orientation. In astronomical telescopes the rotated view is normally not corrected, since it does not affect how the telescope is used. However, a mirror diagonal is often used to place the eyepiece in a more convenient viewing location, and in that case the image is erect but everted (reversed left to right). In terrestrial telescopes such as Spotting scopes, monoculars and binoculars, prisms (e.g., Porro prisms), or a relay lens between objective and eyepiece are used to correct the image orientation. There are telescope designs that do not present an inverted image such as the Galilean refractor and the Gregorian reflector. These are referred to as erecting telescopes.